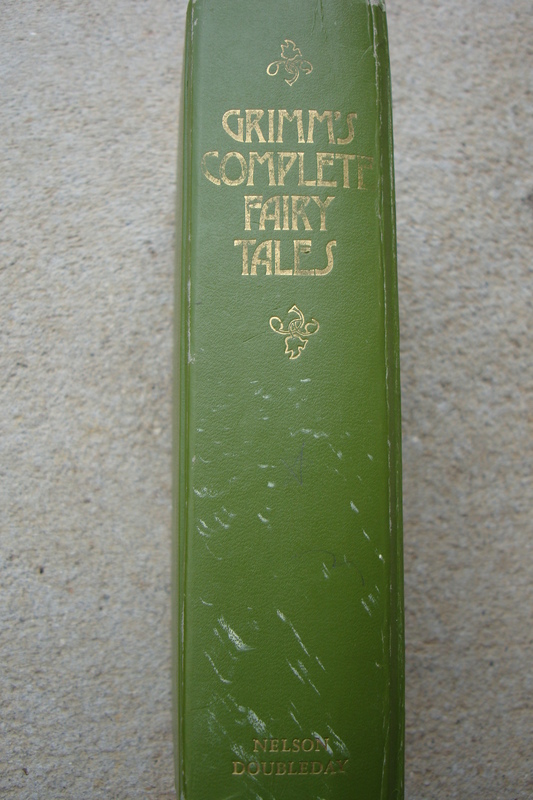 My personal copy of Grimm's Complete Fairy Tales, received when I was 10 or 11 years old. 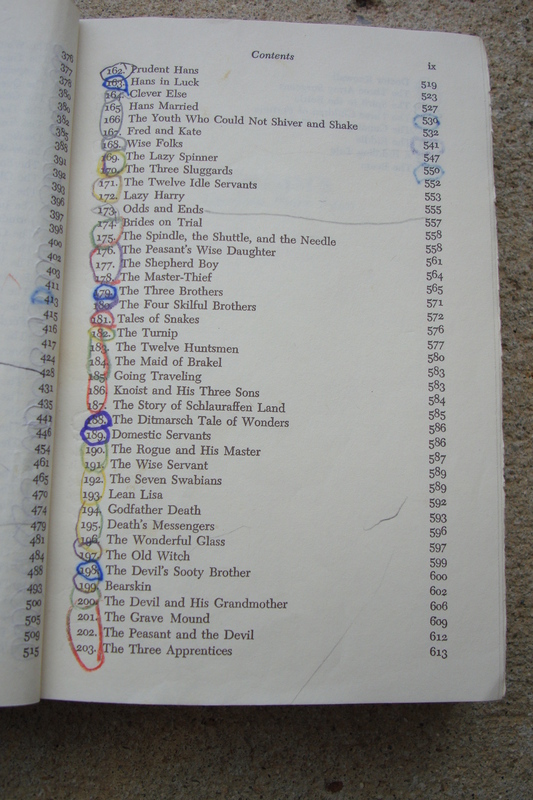 Once upon a time there was a girl named Jules. She was happy. Her family moved from place to place where she had grand adventures with her friends. Then one day, her mother died in a car crash. She was very, very sad. Soon the time came for her to make her way in the world. Jules decided that the University of North Carolina at Chapel Hill would be a fine place to continue her studies. Jules made new friends. Yet strange things kept happening! Her eyes played tricks on her and she heard things she did not want to hear. Familiar foods tasted weird. Jules didn’t know what to do! Then Jules met Nick. He was scary and mysterious. Jules got mad at herself for wanting to find out more about him, especially since there was this nice boy named Andrew. Andrew was skilled with a sword. Jules thought that was hot. Between the two of them, Jules felt like she was in over her head! So Jules ran. While she ran the trails of Battle Park, she thought about Nick. Nick knew something. Jules decided to find out what. She went to see Nick’s band play where the most amazing thing happened. Nick’s music created a magical energy! This both amazed and frightened Jules. During a break, Nick was mean to her. He told a story about being a Troll! Jules didn’t want to believe it but Nick wore the same exact pendant! Why did they have matching pendants? Why did Nick say he knew Jules her whole life? What a liar! Worst of all, he kissed her in front of everybody! The next day Jules confronted Nick. He told her a fantastical tale about the strange things happening to her. Jules felt a little bit sad that she was never going to be normal like her friends. At least she wasn’t alone anymore. She had Nick now. And boy did she! Nick would not go away, no matter how much Jules ignored him. But it;s hard to hate someone who takes you on a cool hiking trip to South Mountains State Park. They went swimming and Jules got to see his cave. Nick even taught Jules how to put her shields up so she could have some privacy. She didn’t want him spying on her and Andrew. Jules liked Andrew alot. Maybe too much. They would run together in the mornings. Jules felt hopeful. Love does that. Then a horrible thing happened. Nick set Andrew up! This made Jules angry. She didn’t like being angry. She was better at being sad and depressed. Anyway, Jules was sooo angry she stopped talking to Nick! But Nick had a plan to get her to talk to him. On Halloween, he dressed up like a fencer and challenged Andrew to a duel. Andrew didn’t even know it was Nick! But Jules did.